Hector Hugh Munro (1870–1916) wrote his short stories under the pseudonym Saki. He wrote a future war story about a German invasion, leading to the capture of London, only just before the outbreak of war: When William Came: a Story of London under the Hohenzollerns (1913). 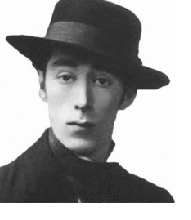 But he is best known for his short stories, many of which were weird and fantastic: these were collected in books such as Reginald (1904), Reginald in Russia and Other Sketches (1910), The Chronicles of Clovis (1911), Beasts and Super-Beasts (1914) and other posthumous volumes. Almost all of them were collected together as The Short Stories of Saki (H.H. Munro) (London: John Lane / The Bodley Head, 1930), which has been reprinted many times. For more information, see the Encyclopedia of Science Fiction. Munro was born in Burma, the youngest of the three children of the inspector-general of police in Burma. He was brought up with his brother and sister by two aunts near Barnstaple, Devon. (He has several stories in which stern unpleasant aunts are outwitted by children.) He was educated at Exmouth and at Bedford Grammar School, until Colonel Munro returned from Burma in 1887 and took the children travelling. In 1893 Munro joined the Burma police, but his malaria forced him to return home. He decided to move to London to become a writer. In 1900 Munro began writing short satires, using the pseudonym Saki, the name of the “cypress-slender Minister of Wine” in the Rubáiyát of Omar Khayyám. In 1901 the first of his short stories about an exquisite young man named Reginald was published. In 1902 Munro went to the Balkans for the Morning Post in 1902, then to Warsaw, St Petersburg, and Paris; his reports show his right-wing convictions and his hatred for socialism. He returned to London in 1908. He had relatively few friends; some of those friends knew about his associations with young men. He soon started publishing his short stories, originally for the Westminster and then for The Morning Post and elsewhere, and wrote scores between 1909 and 1914. He only wrote two novels: his wit and imagination were better suited to the short form. His war service ultimately brought his writing career to an end. My information comes largely from Dominic Hibberd’s entry in the Oxford Dictionary of National Biography.